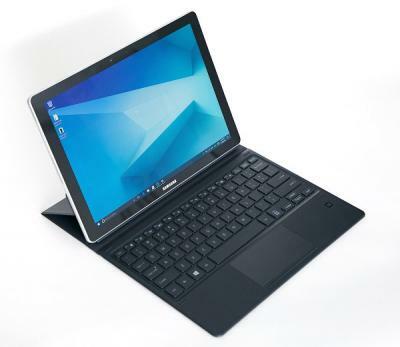 Samsung's Galaxy Book 12" is a Windows 10 professional tablet that features a 12" 2160x1440 Super AMOLED display, an intel i5 CPU, 4/8GB of RAM and 128/256 GB of storage. Samsung's Galaxy Book 12" is now shipping - for around $1,100 (4GB RAM, 128GB storage). Isn’t 2160 a typo instead of the correct 2560? (Oh, looks like TabPro S had the same 2160×1440 resolution resulting in the aspect ratio of 3:2 instead of 16:9). As for the device itself, I hoped it will be a real laptop with undetachable keyboard, but according to the photo, it’s still just a tablet with a wireless keyboard like the previous TabPro S.
Or is the photo not of the new device, but of TabPro S?